Robert Scott, born in Ballardvale in 1830 to Scottish immigrants, was Andover’s first war fatality. His father Andrew Scott was the overseer of the looms in the Ballardvale Mills before his death in 1850. Robert worked before the war as a house carpenter in both Andover and New York City. He was one of three sons of this family who enlisted in the Union army, although none were credited to the town of Andover. 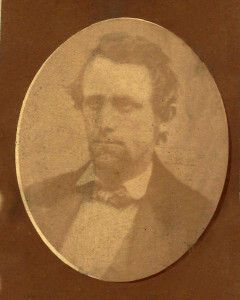 His brother William, a printer in Buffalo, survived the war. Brother Jesse Scott was accidentally shot at Fort Albany, Virginia in August 1861. Robert Scott was a member of the famous 14th Regiment of the New York State Militia, known as the “Fourteenth Brooklyn” or the “Red-Legged Devils” after their distinctive Zouave-style uniform trousers. The regiment was first organized by abolitionists from the Brooklyn area of New York, and earned both its reputation for hard fighting and its nickname during the first battle of Bull Run, the first major land battle of the War. As the regiment repeatedly charged up the field’s long hill on July 21, 1861, the relatively unknown Confederate General Thomas J. Jackson yelled to his men, “Hold on, boys! Here come those red legged devils again.” The brigade of Virginians, of course, stood their ground “like a stonewall,” and earned their general a nickname of his own.